Did you know people watch 4 billion videos per day on YouTube? It is officially the #2 search engine in the U.S. (after Google), and gets more traffic than Facebook! YouTube is a great platform to showcase your services in a unique way, and increase your online exposure to connect with more clients (for free!). To get started, simply create your own branded channel on YouTube. Ready to get started? Follow the simple steps below, and set up your YouTube Business page. Step 2: Choose a name for your channel, which will be the name users see when visiting your channel. To create your channel, click on your account name in the upper right hand corner and then select ‘Channel’ in the menu to get started. From here, you will be able to create a username for your YouTube account and start your channel. We recommend using your business name so it appears in search. If it is taken, try for a slight variation—for example you could include your location. Step 3: Customize your account. You are able to change the background image and layout of your page, so personalize these for your business by including your logo and a favorite photo showing off your best work. Step 4: Be sure to include your other social media accounts on your YouTube page, including Facebook, Twitter and more. Easily integrate your accounts onto your YouTube business channel to share your other online presence with potential clients, and further improve your SEO. Step 5: Add videos to your channel! Click the ‘Upload’ link to the right of the search box to start uploading. Be sure to add a good title and description, be sure to tag your videos with relevant keywords to help increase your exposure across the web. Get started by uploading the videos you created with the WeddingWire Video Builder, your past work, and even client video testimonials. Congrats—you have created a YouTube channel, and established a video presence to expand your business’ reach! Utilizing video capability on YouTube should be a part of your marketing efforts. Whether client testimonials, videos from past event, or a personal introduction to potential clients, you can use YouTube to further market your business. 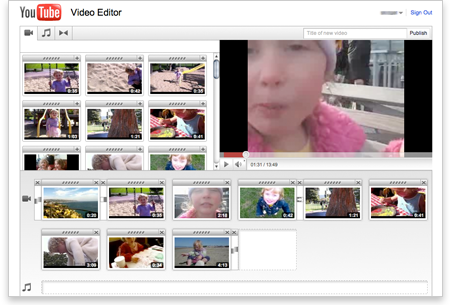 YouTube makes it easy to edit your videos online, even without any experience. Easily add effects, transitions, crop your videos on your timeline, and even add songs to the video from the approved selection in their library. Click here to get started with YouTube Editor. How have you incorporated videos into your website or blog?